Please refer to the above option drop-down menus to see which finishes are available for this particular item. ** Finish / Color swatches may appear differently on different monitors and may not be 100% accurate. Create versatile storage and display space in any room while enhancing the elegant, contemporary design of your home with the uniquely designed London Composition 002 by Tema Home. 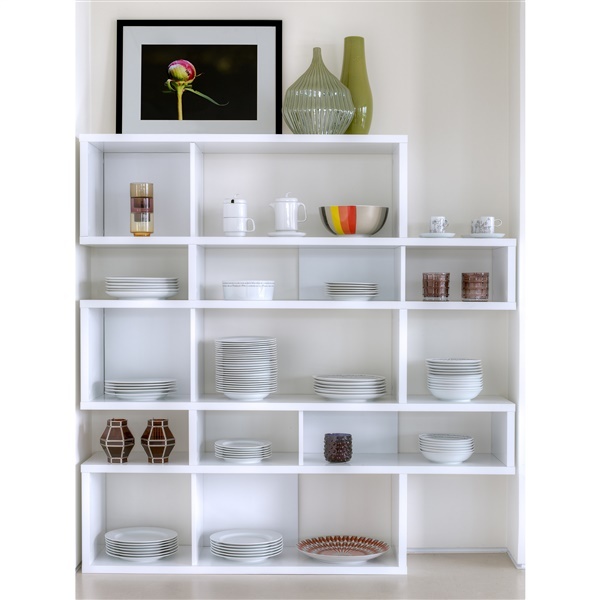 Fusing everyday function with chic, distinctive style, this modern shelving unit features a fresh, contemporary design that includes five unevenly stacked shelves that create both a unique look and versatile storage and display space � perfect for books and other media, framed photos, vases and sculptures, magazines and other personal decor! If its style isn't already unique enough, the London Composition 002's frame and back panel finishes can be customized to accommodate your taste and complement your decor. Choose the same color for both to create a consistent look or mix and match for a style that's more aesthetic and unique!